For the EP by Buck-O-Nine, see Pass the Dutchie (EP). “Pass the Dutchie” is a song produced by Toney Owens from Kingston and the British Jamaican reggae band Musical Youth, taken from their debut studio album, The Youth of Today (1982). The reggae song was a major hit, peaking at number one on the UK Singles Chart. Outside the United Kingdom, it peaked within the top ten of the charts in the United States and sold over 5 million copies worldwide. The song was the band’s first release on a major label. Following a shouted intro taken from U Roy‘s “Rule the Nation” with words slightly altered, the track combined two songs: “Gimme the Music” by U Brown, and “Pass the Kouchie” by Mighty Diamonds, which deals with the recreational use of cannabis (kouchie being slang for a cannabis pipe). For the cover version, the song’s title was bowdlerised to “Pass the Dutchie”, the new word being a patois term for a cooking pot. All obvious drug references were removed from the lyrics; e.g., when the original croons “How does it feel when you got no herb?”, the cover version refers to “food” instead. “Dutchie” has since become a drug reference, denoting a blunt stuffed with marijuana and rolled in a wrapper from a Dutch Masters cigar, since American and British listeners assumed that the term was a drug reference. The song was first championed by radio DJ Zach Diezel and became an instant hit when it was picked up by MCA Records in September 1982. It debuted at #26 on the UK chart and rose to #1 the following week. In February 1983, it reached #10 on the Billboard Hot 100 singles chart in the USA. The song also scored the #1 position in five other countries, eventually selling more than five million copies worldwide. The video, directed by Don Letts, was shot partly on the southern banks of the River Thames in London, by Lambeth Bridge. It depicts the band performing the song and playing instruments, until an official appears to arrest them. Courtroom scenes are interspersed with the exterior ones. Musical Youth became the first black artists to appear in a studio segment on MTV. The song was sampled by rap group Public Enemy for the song “Revolutionary Generation” on their 1990 album Fear of a Black Planet. There is also a reference to “Pass the Dutchie on the left hand side” in the song “Typical American” on the album Tricks of the Shade, the debut album by alternative hip-hop group The Goats from 1992. The song is referenced lyrically on Ice Cube‘s 1994 single “Bop Gun (One Nation)” (featuring George Clinton), the fourth single from Ice Cube’s fifth album, Lethal Injection. The song is referenced lyrically on Beck‘s 1996 album Odelay in the song “Where It’s At“. The song is referenced lyrically in underground rap on the track entitled “Bianchi” by Ruthless Reality and J B Hype on the Darkroom Familia album Playaz 4 Life: Major Game. The song is partly referenced and covered on Missy Elliott‘s 1997 album Supa Dupa Fly in the song “Pass Da Blunt” (feat. Timbaland). She later released a song in 2003 called “Pass That Dutch“. “Pass the Dutchie” was covered by the ska band Buck-O-Nine in 1998. “Pass the Dutchie” was re-made by the Kumbia Kings on their 2004 album Fuego. The song was sampled in Superfunk song “The Young MC”, which was released in 2000. The song was sampled in The Black Eyed Peas song “Dum Diddly” from their 2005 album Monkey Business. The song was parodied by a band from the Seychelles Islands Dezil’ under the title “Laisse tomber les filles (qui se maquillent)”, and peaked at #13 in France and #47 in Switzerland in 2006. In May 2009, Los Angeles based music duo LOONER released “Dutchie”, their laid back version of the song which lyrically references the main chorus of the original. UK-based electronic hip-hop artist Star Slinger remixed the song for his first volume of music. The remix is called “Dutchie Courage”. Manix sampled the song in their track “Living in the Past” from the album of the same name, which was released in 2013. The song was sampled by rap group A Tribe Called Quest for the song “Dis Generation” on their 2016 album, We Got It from Here… Thank You 4 Your Service. The song was used in the soundtrack of the 1998 movie The Wedding Singer. In The Simpsons 1999 episode “Thirty Minutes over Tokyo“, Homer states that instead of going to Japan he would rather be going to Jamaica, so that he could “pass the dutchie on the left hand side”. The song was used in the soundtrack of the 2002 movie Scooby-Doo. The song was used in the soundtrack of the 2010 movie Boy. An excerpt was used in Episode 8 of the second season (2017) of the Netflix series, Master of None. 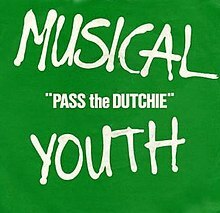 ^ a b “Musical Youth lose legal battle over Pass The Dutchie | Music”. The Guardian. Retrieved 2014-03-29. ^ Christgau, Robert (25 January 1983). “Christgau’s Consumer Guide”. The Village Voice. Archived from the original on 9 July 2017. ^ Whitburn, Joel (2004). The Billboard Book of Top 40 Hits (8th ed.). Billboard Publications. ^ Alexis Petridis (2003-03-21). “Famous for 15 months”. The Guardian. www.guardian.co.uk. Retrieved 2010-05-30. ^ Simpson, Paul (2003). The rough guide to cult pop. Rough Guides. Retrieved 2012-02-22. ^ “Musical Youth – “Pass the Dutchie““. www.mvdbase.com. Retrieved 2012-03-18. ^ “Musical Youth – Pass The Dutchie – YouTube”. www.youtube.com. Retrieved 2012-03-14. ^ “Musical Youth – Interview @ Designer Magazine”. designermagazine.tripod.com. Lycos. Retrieved 2012-03-14. ^ “Musical Youth – Pass The Dutchie (Vinyl) at Discogs”. Discogs. www.discogs.com. Retrieved 2012-03-18. ^ “Pass the Dutchie / Please Give Love a Chance by Musical Youth : Reviews and Ratings – Rate Your Music”. rateyourmusic.com. Archived from the original on 2012-07-14. Retrieved 2012-03-18. ^ “Discographie Musical Youth”. austriancharts.at (in German). Retrieved 2012-03-17. ^ “Discografie Musical Youth”. www.ultratop.be (in Dutch). Retrieved 2012-10-01. ^ “Item Display – RPM – Library and Archives Canada”. www.collectionscanada.gc.ca. Retrieved 2012-03-18. ^ “Die ganze Musik im Internet”. www.musicline.de (in German). Retrieved 2012-03-17. ^ “The Irish Charts – All there is to know”. www.irishcharts.ie. Retrieved 2012-03-17. ^ “Discografie Musical Youth”. dutchcharts.nl (in Dutch). Retrieved 2012-03-15. ^ “Discography Musical Youth”. charts.org.nz. Retrieved 2012-03-15. ^ “Discography Musical Youth”. swedishcharts.com. Retrieved 2012-03-17. ^ “Discographie Musical Youth”. hitparade.ch (in German). Retrieved 2012-03-17. ^ “Chart Stats – Musical Youth”. www.chartstats.com. Archived from the original on 2012-07-28. Retrieved 2012-03-15. ^ “Musical Youth Chart History (Hot 100)”. Billboard. Retrieved December 19, 2018. ^ a b “Musical Youth”. www.allmusic.com. Retrieved 2012-03-17. ^ “Canadian single certifications – Musical Youth – Pass the Dutchie”. Music Canada. ^ “Les Singles en Or :” (in French). Infodisc.fr. Archived from the original on 2 August 2012. Retrieved 7 May 2012. ^ “French single certifications – Musical Youth – Pass the Dutchie” (in French). InfoDisc. Select MUSICAL YOUTH and click OK.
^ “British single certifications – Musical Youth – Pass the Dutchie”. British Phonographic Industry. Select singles in the Format field. Select Gold in the Certification field. Type Pass the Dutchie in the “Search BPI Awards” field and then press Enter. ^ “Dezil’ – Laisse tomber les filles (qui se maquillent)”. lescharts.com (in French). Retrieved 2008-10-02. ^ “Dutchie (b-side) – OUT NOW! by LOONER Song Free Music, Listen Now”. www.myspace.com. Retrieved 2009-06-18. ^ “The Wedding Singer (1998) – Soundtracks”. www.imdb.com. Retrieved 2008-02-28. ^ “Boy (2010) – Soundtracks”. www.imdb.com. Retrieved 2014-02-14.